For those who don't know what Monster Strike (MS) is, it's a mobile game that combines pinball and slingshot aspects to fight monsters (same way how it is in the anime, but with AR). Other than that, the gameplay is quite similar to Puzzle & Dragons. The anime caught my interest so well within the first couple of episodes with their comedic parts and 4th wall breaks that were pretty amusing. People seem to get the wrong idea for why each episode is 8-10 minutes. These are ONAs, which means it's a web series and not a full length television anime. I was really into it but lost a lot of interest when season 2 came out. Don't get me wrong by the star rating, season 1 and the movie was worth the watch, but I regretted watching season 2 and onwards. Overall, I would just say, definitely watch season 1 and the movie, but be wary of what comes afterwards, cuz it's a whole different thing beyond that. As far back as I can remember, I've enjoyed animated shows where something arbitrary is used to save the world. Yu-Gi-Oh ZeXal (subbed) and Bakugan (dubbed) come to mind. Naturally, when this animation came onto the scene, I was stoked to watch it. It had everything: interesting mysteries, quirky characters, and a decent setup for a plot (in this case, the missing memories... and the mystery of Ren's color-changing hair XD). As MS went on, it kept getting better. More questions, vague answers and an interesting conflict, since the protagonist's goal is being hindered by the team member he replaced. Starting from the second story arc (where the main cast go on a quest to find Haruma, an old teammate), I felt something was wrong. The plot felt wackier- more... padded and slow. Since I heard about the 3DS game (sadly, no localization ;_;) having a similar story to the animation, I watched a Japanese Youtuber play through it and I enjoyed the story- or what I could infer from it. Oh my gosh, that ending! That was perfect! Cheesy, but perfect! The villain was threatening, as was the final arc for the story! This was a great game! Back to the ONA, though. The short episodes made me come back for more. Since there was nothing major happening, it felt like I was being led on- lead to become hyped for a major twist near the end. This is where the show just throws itself off a cliff. The War Gods sounded interesting, and I was expecting the show to invoke the Eldritch Abomination trope. Sadly, they just turned out to be humanoid gods with flashy CGI powers. Their battles were kinda lowering my standards for the show, too- often relying on comedy to keep you watching. And then there's the final arc of the story- where the hero and his partner must stand against all odds to defeat the great evil they defeated in the past. Being a fan of how the 3DS game's climax went, I was pumped after such stagnant episodes. It was at this moment, that I grew to despise the animated series. Among many of the problems with the final arc, there was the fact that Oragon's true form was never revealed (he's just a massive flaming dragon, woo-hoo...), the contents of the characters' memories never being revealed (literally, it's the same shot of them playing together as kids over and over) and the final showdown not being as climactic as I had hoped (the hero literally gets shot with energy bullets... and just sits there while the runtime for the episode dwindles.... only to come back out of nowhere and win). Also, Ren's hair changing color was never explained. I know that the "movie" is the climax to the series itself. And, sure, it explains a lot of plot holes in the series itself. But I would've liked this closure in the series proper!! "But Manga!" you say. "This is intended for people who play the game! Not you!" Shut your yap. If it's a Japanese cartoon, I'm watching. Nuff said. Also, I would have liked for Oblivion (final boss of the 3DS game) to have been the big bad of the animated series. As a one-eyed bio-mechanical monster of doom and destruction, he looked threatening- more threatening than a white-haired, red-eyed shirtless dude with standard magic powers and creepy rocks. 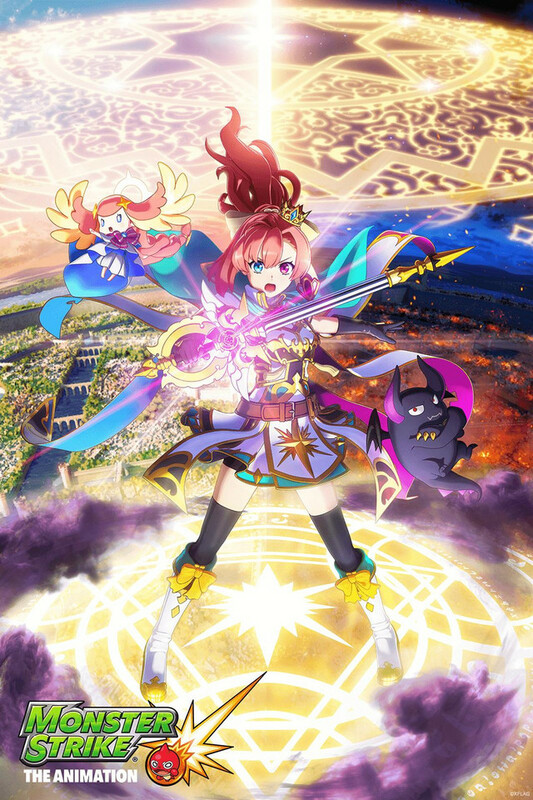 Overall, Monster Strike is an animated series that some people may like. But personally- and a LOT of people agree with me on this- I think it's a worthless pile of garbage. This show deserves at least 2 stars for a good concept, but its flaws (mainly in my opinion) that nullify that second star. Don't watch unless you want to be irritated. I took an interest to the show because it held similarities to digimon/puzzles and dragons x ect ect ect. The added bonus of the missing memories which introduced an epic storyline showed great promise as well. Season 1 : Each episode is only 8 minutes long which makes it hard to get invested in the show. Ren's memorie are never recovered (you discover them in the movie at least). You never find out why his hair changes color when he activates the game which seemed super important since when his hair turned red he seemed to recall his past better. The moment they get new monsters, either the original ones are never to be seen again or the newly acquired ones are never to be seen again after being acquired. Other then using your phone to launch your monster at other monsters, only the first few episodes really focused on the angles of shots for extra damage. Season 2 : We are now suddenly in 3D and K is over the top nutty professor barely ever mentioning his son Haruma or his wife who was the while point in season 1. The whole focus of teams of 4 is thrown out the window ehen a 5th player is brought into the group. Oragon is also demoted to sidekick comical relief who never battles. Second half of the season is 2D and past characters of season 1 show up out of no where to help at the end. Monster strike the movie : omg one of the only things i actually enjoyed most of. Seeing the game in development and the crew as kids being testers was great. Akira going back in time and seeing Oragon in his true form the entire time also great. The fact the parents werent out searching for their kids once they escaped the research lab, wtf? Otherwise good movie. Spin off MSSonic: seems at this point monsters are fully assimilated in Japan and it focused entirely on different monsters trying to become idols. Lucie is the only character that is recurring but somehow she's no longer with Haruma and not explained why. Not bad for a stand alone spin off for music lovers. Hated the 3D performances. I do wish they would explain Ren's red hair when he uses the game and also cover what happened to his father. This anime is honestly pretty good. It had its ups and downs (3D animation) but very time efficient for me. This anime’s episodes are very short and I can watch it on very tight schedules because of school. The plot is not bad either. Pretty good for an anime based off of a game.